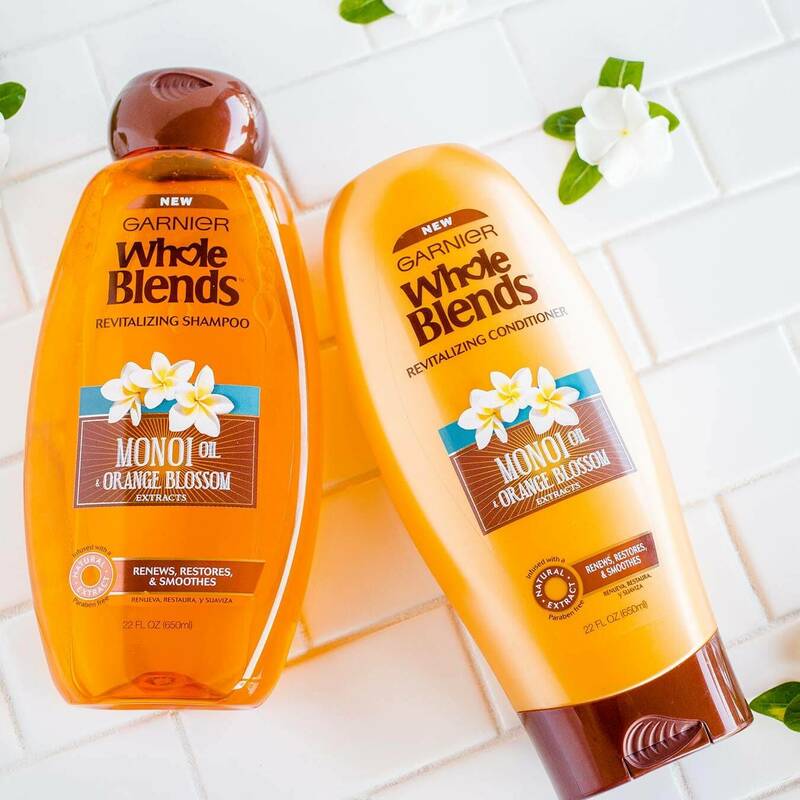 Our nourishing, silky Revitalzing Shampoo formula blooms with a floral, tropical aroma of Monoi oil & citrusy Orange Blossom, bringing to life our wholesome care that restores dull, dry hair, exclusively at Walmart. Massage into wet hair, lather and rinse thoroughly. Follow with our Revitalizing conditioner. "AQUA / WATER / EAU SODIUM LAURETH SULFATE COCO-BETAINE COCAMIDE MIPA SODIUM CHLORIDE COCOS NUCIFERA OIL / COCONUT OIL TOCOPHEROL SODIUM BENZOATE SODIUM ACETATE SODIUM HYDROXIDE PPG-5-CETETH-20 PEG-55 PROPYLENE GLYCOL OLEATE PEG-60 HYDROGENATED CASTOR OIL POLYQUATERNIUM-10 SALICYLIC ACID LIMONENE BENZYL SALICYLATE BENZYL ALCOHOL LINALOOL VANILLA PLANIFOLIA FRUIT EXTRACT AMODIMETHICONE PROPYLENE GLYCOL ISOPROPYL ALCOHOL GARDENIA TAITENSIS FLOWER CITRONELLOL CITRUS AURANTIUM AMARA FLOWER OIL / BITTER ORANGE FLOWER OIL CITRIC ACID LAURETH-5 CARBOXYLIC ACID HEXYL CINNAMAL GLYCERIN PARFUM / FRAGRANCE F.I.L. D207631/1 "
Rated 5 out of 5 by Savvylee from Makes my hair feel healthy This shampoo is great. My hair feels moisturized and healthy. I only have the shampoo and not the conditioner. It seems like I don’t even need conditioner. The oil in the shampoo seems to condition on its own. I don’t understand why it is a walmart exclusive. A shampoo like this should be distributed everywhere for people who do not want to shop at Walmart. Rated 5 out of 5 by jennapoo96 from Absolutely amazing My family has been using the Monoi Oil and Orange Blossom for two weeks and we absolutely love it!!! Our hair is softer has more body and smells AMAZING!!! I will definitely recommend this product to everyone I know!!! Rated 2 out of 5 by SB25 from Disappointed Bought this 3 days ago. Used it three times since. I have fine , dry, frizzy hair with oily scalp. I put some coconut oil on my hair before washing it with shampoo. This shampoo could not get the oil out of my hair with two washes! I had to use it for the third time. I have seen a lot of hair fall during the wash. The smell is amazing. It gives the hair bounce. It's not as good as legendary olive. I would return the product. Rated 3 out of 5 by Catiepaige from Great, but has a couple of downfalls I'm so torn as to whether I love this shampoo or not. Here are the positives: 1) It smells great! I cannot talk enough about how much I love how it smells. It doesn't smell like perfume or cologne like many 'fancy' shampoos do, and it also doesn't smell overly flowery or fruity. It smells like orange blossom with a hint of something else. It smells like a shampoo is supposed to, nice and clean without being cloying or overpowering! 2) My hair feels very clean! 3) It lathers nicely buuuuuutttttt..... Here are the cons: 1) I cannot get a good lather without using way too much product. I think the shampoo has been watered down too much. It dribbles out of the squeeze top the second the bottle is turned upside down, and it makes a mess. The formula is just too thin. 2) It isn't gentle enough for my heavily bleach damaged hair. It dries out my hair too much. Rated 4 out of 5 by ColoradoJJ from Fragrance and Body and Shine, Oh MY! 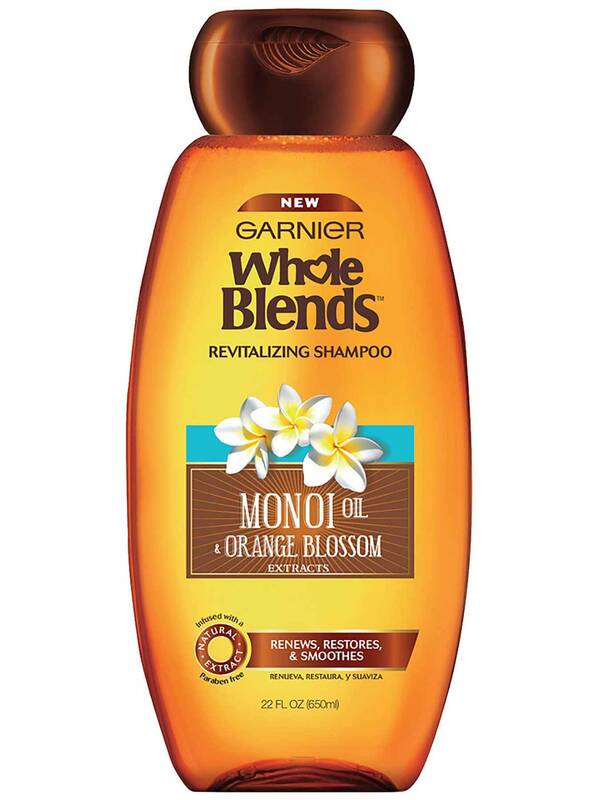 I tried Garnier Whole Blends Monoi Oil and Orange Blossom extracts shampoo, and found it to have these three qualities, in that order. Monoi Oil is a perfumed oil made by soaking Tahitian Gardenias (yummy!) in coconut oil. The oil is used as a hair and skin softener. I have always loved the scent of gardenias, and from the moment I opened the bottle the fragrance filled not only the shower, but my husband could smell it when he entered the house. I loved this! You can pick out the scent of gardenias as well as orange blossom, and it just smells fantastic. I noticed that after drying and styling my hair it retained a light and feminine version of the scent. This shampoo gave my long, thick straight hair a body boost. I noticed that it felt even thicker than before. It also created a soft shine, which was nice and made my hair look bouncy and healthy. Though I do not treat my hair chemically at all, it is on the dry side and I look for products specifically that moisturize and nourish my hair. I would say that it did a pretty good job. 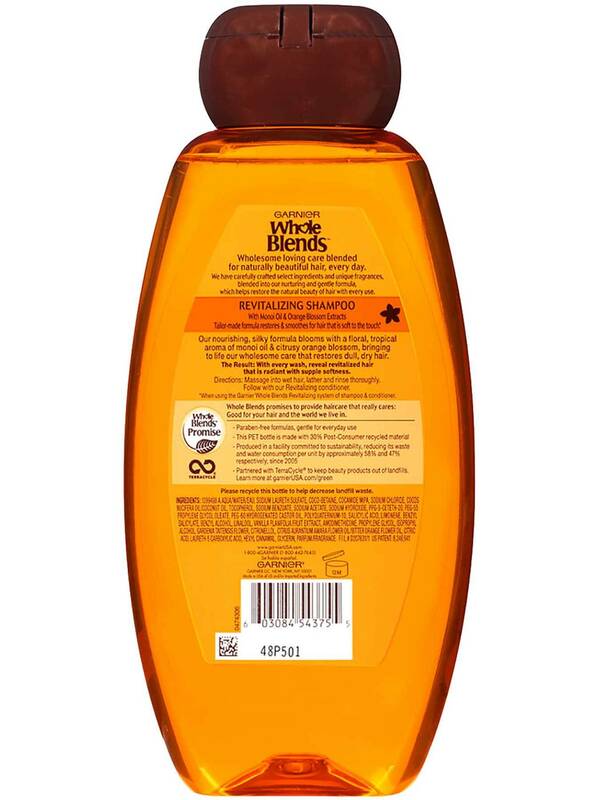 One thing I would like to mention is that, as a strawberry blonde, for some reason this shampoo seemed to bring out the red tones in my hair where before it had looked much lighter. Rated 5 out of 5 by LThorp13 from Smells good and cleans I loved this whole blends Revitalizing Hair Care with Monoi Oil & Orange Blossom extracts. I have used other whole blends products in the past and loved all of them. But this one felt good, smelt good, and mad my hair feel so clean. It is almost as if it conditioned before the conditioner. Rated 5 out of 5 by MelissaCampos from Floral goodness! This shampoo smells so good! It has a soft but distinct floral scent that lingers in your hair. It did a great job cleansing. I have naturally curly frizzy hair and I definitely think this helped with smoothing the strands themselves. Wonderful product! Would definitely throw this in my rotation in the future!